It’s safe to say that most people treasure their decks—but it’s also true that far too many fail to give this part of the home the loving attention it needs. There are a number of reasons why homeowners often fall short in their deck upkeep responsibilities, one of the most common being an understandable reluctance to spend money on a tight budget. If the deck sees little activity over the course of the year—some people go out there only on major holidays, if that—it’s easy for people to convince themselves that no maintenance action is necessary. This is a serious misconception, however. Even when you’re not using your deck, it’s still vulnerable to damaging hazards. UV rays from the sun are an underestimated menace, causing premature aging to your deck boards, particularly if these haven’t been treated with an adequate sealer. In addition, the alteration of warm and cold weather over the course of the year causes boards to expand and contract. This will gradually enlarge cracks in the wood. That’s not all. Rain and snow can cause the formation of moisture pockets on your deck, which in turn invites wood-destroying mold and termites. Moisture promotes rust on nails and screws as well. By the way, many homeowners do not realize that the leaves that tend to collect on their decks also contribute to the retention of harmful moisture, not to mention the development of ugly stains. Ignoring these issues can cost you a lot of money in the long run—all because you wanted to save a few dollars in the short run. Badly deteriorated decks often rack up huge refurbishing bills. You need to keep your deck clean and properly protected against these natural perils. Luckily, this isn’t terribly difficult or expensive. 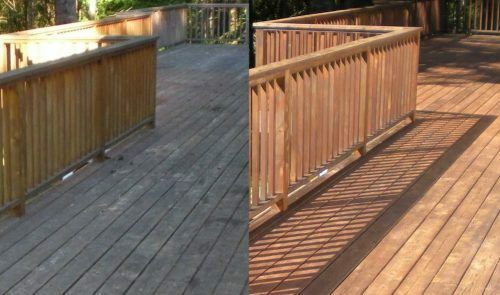 Deck Guru provides deck cleaning and maintenance services that will keep your deck in sound condition. Our professional services can remove hard-to-see dirt and microbes that casual cleaning techniques frequently miss, and then apply a durable coating that will create a long-lasting barrier of defense against the forces of nature. Contact us for more information.